Regular clinics held. Please contact the surgery for further details. All the doctors provide advice on all forms of contraception. This, like all services provided by the practice, is completely confidential. Every Wednesday 2.00 - 4.00pm. These are carried out by the practice nurse. Please note, if your baby is ill please check before attending. For your child’s safety it is ESSENTIAL that you have your child properly immunised. Patients aged 40 - 74 years who are not currently on a disease register can attend for a five-yearly NHS Health Check. If you're in the 40-74 age group without a pre-existing condition, you can expect to receive a letter or phone call from us inviting you to attend for a Health Check. If you would like more information you can click here to see the information provided on the NHS Choices website. Innoculations against polio, tetanus, typhoid, hepatitis A, hepatitis B, cholera and malaria prevention. There is a charge for some of these innoculations. Please see the practice nurse by appointment, preferably two months before departure. You will need to have a tetanus booster every 10 years and a polio booster if you are visiting a part of the world where the risk is high. We also offer a flu vaccine from September every year, especially for the over 65s and those considered to be in an 'at risk' group. Please see the nurse. High blood pressure is a condition which if untreated can lead to damage of the eyes and kidneys and increase the incidence of heart disease. 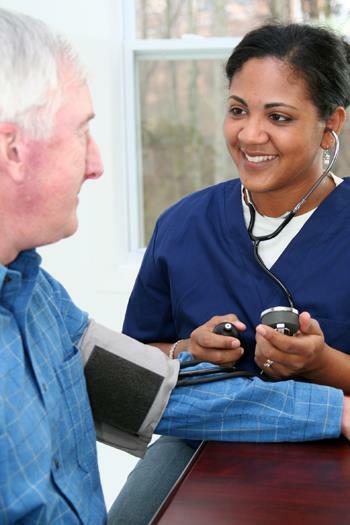 If you suffer from raised blood pressure, the doctor may ask you to attend the practice nurse for advice and monitoring of the problem. Remember that you are welcome to use the 'DIY' BP monitor in the reception area. Educate patients about their asthma/COPD. Monitor them and where possible improve their control and therefore their lifestyles. Carry out lung function tests. Clinics are run every Thursday afternoon, by a doctor and a practice nurse. These are held weekly on a Thursday and are run by the practice nurse (with doctor support if necessary). Most of our diabetic patients are now looked after at these clinics, although some with particular problems will still go to hospital.